There isn't a much cleaner or fresher smell than the scent of just washed clothes, dried outside. Traditionally, on Mondays, you will see long washlines, often stretched between the house and barn, holding clothing in graduated sizes, flapping in the breeze. This wonderful scent has been captured and we have put it in this basic white bar to be enjoyed in the bath or shower. Smells like a juicy apple, fresh off the tree with just a hint of spice added for interest. We thought this would be seasonal, but found it was immediately popular with its yellow green base swirled with red mica. This wonderful scent fills the house and lifts your spirits! Think of fuzzy apricots and creamy freesia... fresh and juicy, sweet yet tart. Makes ya feel "ripe fer the pickin"! Our own natural version of the currently popular 'antibacterial' soap!! The potent essential oil combination of lavender, tea tree, rosemary, and patchouli are well known and documented for their antiseptic qualities. Try Auntie Germaine's good-old-fashioned 'soap&water' purity to keep your hands extra clean. Also great for use in the gym or locker room. A spicy scent of Christmases past that sells well year-round. A lovely blue-green color. Although we use a fragrance oil in these soaps, we also render our own real, fragrant bayberry wax to include in these bars which gives them an extra touch of authenticity. The name of this soap is meant in the best possible way. Wouldn't it be great if life were really like a day at the beach? We created this great scent - fresh and summery - and then designed a soap that reminded us of a walk along a golden beach. We added chunks of all our other soaps to remind us of things like pieces of shell, ocean waves, beach balls, umbrellas - all the wonderful things along the beach. 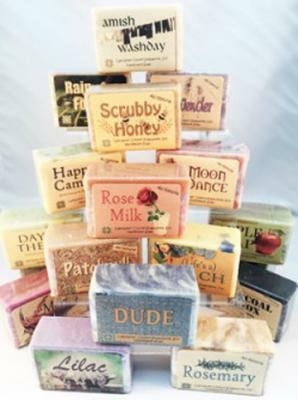 It is a fun and joyful soap! Our version of this popular soap contains activated charcoal as well as an extra quantity of Kaolin clay, both ingredients are said to remove impurities, or clarify the skin. This soap, scented with eucalyptus and peppermint essential oils and containing seaweed gives us the feeling of a luxurious day at the spa.